Warhol work in 'Dollar Art' London auction Jump to media player A private collection of 21 works of art inspired by the US dollar, including some by Andy Warhol, is to be auctioned by Sotheby's London. Christie's record art auction sale Jump to media player The New York auction house Christie's says it set a new art sale record on Wednesday when it sold over $850m (£539m) of contemporary and post-war art. 'Stuart Little painting' auctioned Jump to media player A long-lost avant-garde painting has been sold at auction in Hungary, after a art historian rediscovered it being used as a prop in the film Stuart Little. Bidding for art with emotions Jump to media player The world's first "emotional" auction, where people pay with feelings rather than money, has taken place in Sweden. A private collection of 21 works of art inspired by the US dollar, including some by Andy Warhol, is to be auctioned by Sotheby's London. 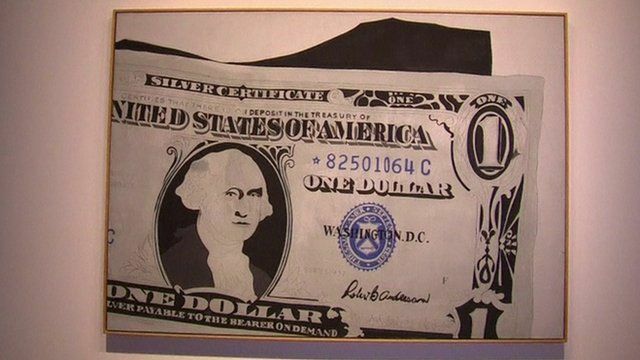 Sotheby's Contemporary Art Specialist James Sevier said that "money is one of the prevailing themes of Warhol's work". 'One Dollar Bill (Silver Certificate)' from 1962 is among the Warhol works expected to sell for millions in the July auction.